"The present is trivia that I scribble down on stupid notes." I have a poor memory. Therefore, in order to remember points about movies to include in my reviews -- I make notes. I usually bring a smart keyboard with memory, occasionally a pen and paper, and once - a digital voice recording device (I whispered). With "Memento," I found myself taking notes during a movie all about taking notes - oh how eerily apropos. "I have this condition, I can't make new memories. I can remember everything up to my accident, after that ... I can't remember. Did I tell you about that?" Lenny (Guy Pearce, also very good in "L.A. Confidential") explains. "Every time I see you," Teddy smirks back. Lenny carries a Polaroid camera to keep track of his friends, his hotel, and his car. He's constantly scribbling notes on the back of the photos. But for very important "things to remember" - Lenny employs tattoos. "John G. murdered and raped my wife" is written backwards across his chest -- he reads it in the mirror every morning. One tragic night, he lost both his wife and his memory. Now he's on a Charles Bronson mission of revenge. This alone makes a pretty good Sunday night mystery. But take that story, slice it like a loaf of bread, start eating from the opposite end and you've got the makings of a masterpiece. Most word processors have the ability to print a document last page to first -- imagine a script being filmed that way! You'll need to engage your entire brain, this is not a picture to sit back and watch - it requires serious concentration, focus and "retention." Outstanding concept and execution, acting prowess by all involved (Harriet Harris is wonderful in a very small role), rock solid dialogue; this dark picture would have made my top ten list with a potent ending (errr... beginning?). Unfortunately, I was not satisfied with either the swell of the climax or the cleverness of the closing. It certainly makes sense that a cerebral film would conclude cerebrally; but as a matter of subjective taste, I would have preferred an emotional and/or visual pay-off. Also, somewhat inexplicably, Lenny never seems to forget about his memory loss. An inclusion easily forgiven and forgotten (forgive me for the rotten pun), because knowledge of his retention problem allows for tasty dialogue and humor. Still a very very worthwhile project showing off a directorial skill ghostly reminiscent of "The Sixth Sense." "Memento" proves memorable. "How am I supposed to heal if I can't feel time?" 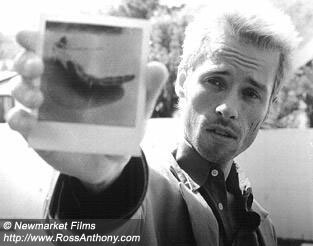 Memento. Copyright © 2001. Rated R.
Starring Guy Pearce, Carrie-Anne Moss, Joe Pantoliano, Mark Boone Junior, Stephen Tobolowsky, Harriet Sansom Harris, Callum Keith Rennie. Written by Christopher Nolan based on a story by Jonathan Nolan. Produced by Jennifer Todd, Suzanne Todd at Newmarket Films.